Lock in a great price for Under Canvas Moab – rated 8.5 by recent guests! The whole staff made me feel welcomed and comfortable throughout my stay. Always willing to help, answer questions, and offer suggestions to make my stay even more memorable. Will definitely recommend to friends and return for the star treatment. A big thanks for everything you do!! We were SO blown away by the smiling friendly faces that worked at the property and were so attentive to my family. The bed was super comfy, and the staff brought in a comfy cot and sleeping bag for our daughter who slept like a rock! We cannot wait to come back! On the ad it claimed to be a heated tent but failed to say it was a wood burning stove you had to feed every 2-3 hours in order to stay remotely warm. No electricity available for cell phones or other electronics- not a big deal except I needed my cell to produce white noise to silence the crazy road traffic. The staff was extremely nice. Great tents and attention to details. Loved wood stove in tent and we needed it! Nice view and location. Very clean. S’mores and live music were nice touches even though weather did not cooperate. Loved the friendliness and knowledge of the staff! With good nearby food recommendations and good hike recommendations. The staff went the extra mile to make sure that we were satisfied 100 percent with our stay! Also, cannot beat the view!!!! 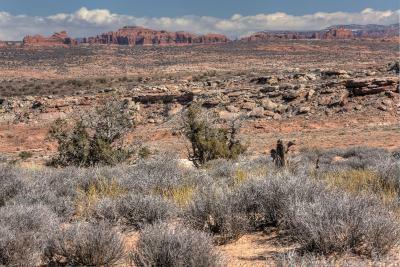 It was a gorgeous location just outside of Moab. The stars in the sky were phenomenal. Space in Tent. 24 hr lobby. Several BBQ cooking areas and the basket of essentials to help prepare your meal. We splurged on this for the experience. The staff are really awesome. The tents are pretty cool, it is nice to a bed in a big clean comfy roomy carpeted bug free tent. The campfire s'mores, live music and meeting other campers make it a great experience. The resort will pack you a lunch for your day excursions, you can also order breakfast. The lobby "tent" is amazing to hang out in, grab free beverages, converse,play games around the fire. The bathrooms are very clean, lots of fresh towels. Well laid out paths. Very attentive staff. Quiet, and peaceful. I was surprised at how large the resort was, and how all the guest seemed to respect privacy, noise, and the environment. I would have thought we were alone! If u love camping, with comfort, this is the way to go! Absolutely LOVED the overall experience. The staff was amazing. The location was fantastic, and the property was so clean and well maintained. We will definitely be going back to this location AND trying others! 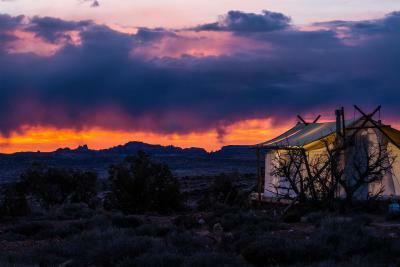 On 40 acres of land, these tents offer spectacular views of Arches National Park, 3 miles away. Select tents feature private bathrooms. BBQ facilities are available on site. Guests of Moab Under Canvas can choose to stay in a basic tent with a shared bathroom or stay in a luxury tent complete with a shower, sink and lounge area with a sofa bed. The luxury tents include a private patio with deck lounger chairs, ceramic sinks and spa products. All tents come equipped with a lantern, bedding and towels. Horseback riding opportunities are available to guests at Moab Under Canvas. Guests can rent bicycles to explore desert bike trails in the surrounding area. Free parking is available to all guests. Moab is 7 miles from this luxury camp. Dead Horse State Park is 10 miles away. Canyonlands National Park is a 50-minute drive away. When would you like to stay at Under Canvas Moab? This luxurious tent includes an private bathroom that includes a shower, sink, flushing toilet as well as a freestanding roll top bath. Tent features views of Arches National Park and a deck with lounge chairs. Also known as Deluxe Safari Tent, this tent features a private bathroom in a tepee next to a tent complete with shower, sink and a flushing toilet. 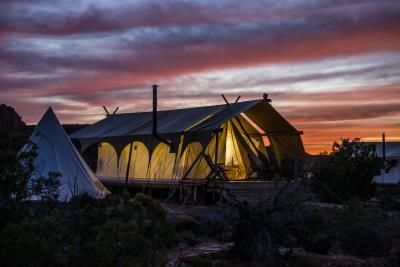 Tent offers a superior uninterrupted view of Arches National Park and a private patio with deck lounge chairs. This tent has a carpeted floor and includes linens, towels, chest of drawers and coat stand. Shared bathroom facilities are provided. 4 single beds are provided. There is NOT room in this tent for a wood stove. House Rules Under Canvas Moab takes special requests – add in the next step! Under Canvas Moab accepts these cards and reserves the right to temporarily hold an amount prior to arrival. Location- right near a major highway with - very loud car/truck noise. Bathrooms: no place to sit, other than the toilet which did not have a toilet seat cover. Only one hook. No place to put your dap kit. Add more hooks, a shelf and a bench and it would greatly improve the bathroom. The road noise and the cold shower. More highway noise than I expected; definitely go for a room on the back side. Very expensive since when all camp fees, taxes, meals are included. Not good value for money. The only negative was the freeway noise at night. Something out of the ordinary hotel room. Close too al the off toad trails we wanted to hit. Cool experience. the location is not suitable for a camping site. It is directly next to the busy highway (also during the nite). Real bed under the canvas. Very comfortable. Staying at Under Canvas was like camping in the easiest way possible. Everything was prepared and ready for us to enjoy. The staff were supper friendly. Aside from the amazing tents, they had a cool set for bbq and they gave us everything we needed. We only had to bring our meat and vegetables. We would definitely go again!